I focus on listening to your wishes then spend time with you creating the perfect look – whether for a wedding, special occasion or photoshoot. 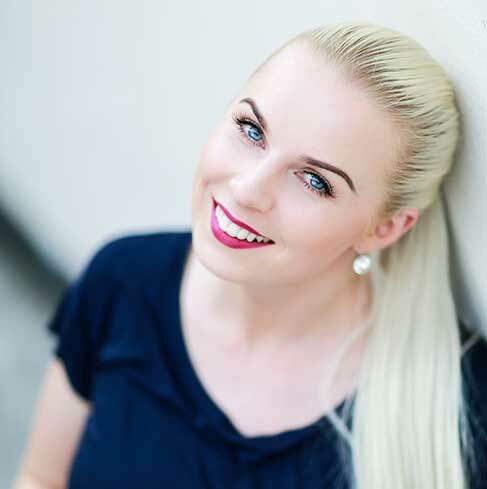 “My name is Aušra and I am a mobile makeup artist and bridal hairstylist based in Surrey. I have trained in the UK at the Pixiwoo school run by renowned makeup artist sisters Samantha and Nicola Chapman and with Mario Dedivanovic, personal makeup artist to Kim Kardashian. I have also studied in Lithuania at the most acclaimed beauty academy in the country, the same one attended by Kristina. In addition, I have completed a number of masterclasses with Kristina and hairstyling courses to ensure that I offer the same high standard of service and quality that she is known for. Makeup artistry and bridal hairstyling are my passion – I am constantly following trends and styles in the latest fashion publications, TV shows, and web forums and am always keen to try out new products. My aim is to give my clients the perfect finished look with the best customer service and using the highest quality products. To me, makeup and hair are about highlighting the beauty in you, my client. I focus on listening to your wishes and then spend time with you creating the perfect look – whether for a wedding, special occasion or photo shoot. weddings bookings at any time that are over 50 miles from Woking (post code: GU22). the bride + 1 guest for makeup and hair. Please note that for all peak time wedding bookings from 1st Jan, 2020 onwards there will be a minimum charge of £500 for Aušra’s services. £150 for longer than 20″. To hire extensions a £50 deposit must be paid in advance as well as the £70 charge, the deposit is refunded upon their return. Please see out Terms & Conditions page for details on how they must be returned. Click here to check out some of Aušra’s testimonials.